Marcussen Organ (1967) in Helsinki Cathedral, Finland. 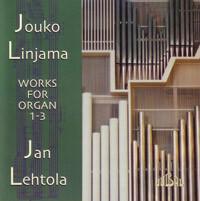 Kangasala Organ (1987) in Kallio Church, Helsinki, Finland. Åkerman Organ (1995) in Kallio Church, Helsinki, Finland. The organ by Veikko Virtanen Oy (1979) in the Church of the Cross, Lahti, Finland.